Where are the jobs and economic growth of tomorrow going to come from? One dead cert is healthcare. 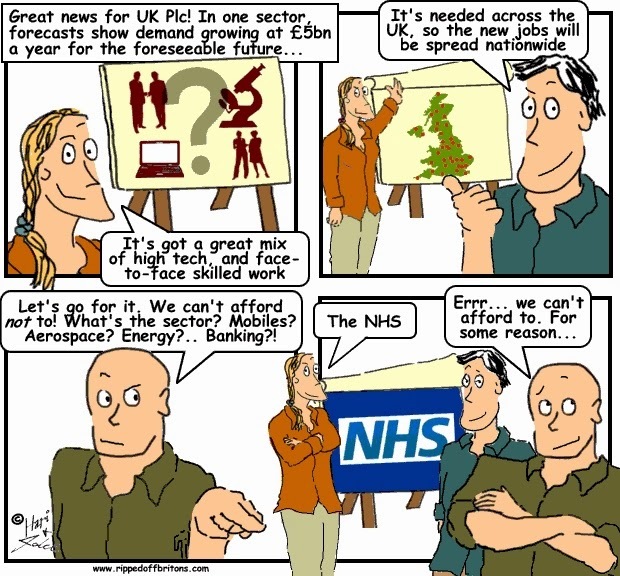 So it completely mystifies me that the NHS is always described as a “cost”, whereas increased spending on anything from cars (£71.6bn, up 3%) and games (£4.2bn, up 5%) to soft drinks (£14bn, up 2.7%) and pet products (£4.6bn, up 3%) is celebrated and can win someone a knighthood. The champions of an economy are the sectors that use high skills, and technological innovation. They are the ones that deliver better products, services, results and overall living standards than they did the year before. And we’ll always need low and medium skilled jobs. Not just because such jobs support the cutting edge activities, but because getting any product or service out of the door and onto the high street needs skills at every level. Uniquely, our health industry does it all. From trolley pushers to brain surgeons. From brooms and paperclips to MRI scanners and precision surgical knives. Healthcare creates jobs from top to bottom within the NHS, and for all the businesses that stock and service the NHS. And on top of all that, uniquely, it does it across the country in every region, rich and poor. 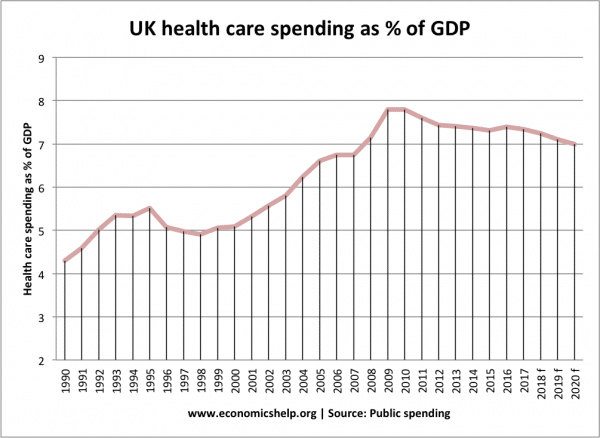 So why are we cutting the NHS? Spending as a percentage of GDP is dropping. Previous governments raised it, recognising it's value in terms of health and wealth. Tory spending per head has flatlined. This is happening while the population is ageing overall, and modern treatments are better yet more expensive. That’s the core NHS budget. But total health spending in England (which includes things like public health, education and training) is set to fall by almost £5bn over this parliament. “We can’t afford it!” Why? What were you planning to spend your money on? What makes you think if we spend less on healthcare, we’ll spend it on technology, engineering and other pro-growth sectors in the UK? Give me a tax cut and won’t I spend it on Ubers and coffee, or an imported car that gives one job to a UK car salesman whose skills – polishing a windscreen with his cuff while you sign on the dotted line – haven’t changed since the invention of the car salesman. Our “dazzling” employment figures are holding up overwhelmingly because of the creation of low-skilled, self-employed and zero-hour jobs. As far as UK Plc is concerned, they are dead end jobs. “We’re cutting NHS fat, not the muscle. They’re efficiency savings.” Show me a report that says the NHS is less efficient than somewhere else. They’re not easy to find. The NHS comes top of most tables. Where it’s beaten (healthy lives: mortality amenable to medical care, infant mortality, and healthy life expectancy at age 60) it’s beaten by countries that simply spend more. So what’s the difference between spending extra billions via taxes on the NHS, and keeping that money in our pockets so that we can spend it on whatever we like? Big, if you want a modern economy of the top rank (errr... and “universal healthcare free at the point of delivery for all,” you soppy twit). But if you’re offended that someone else (the state) is deciding how your damn money is spent, then you’ll see no difference. Fine, but please take your hands off the nation’s steering wheel, for all our sakes. Yes, I get it. The right wing ideologues don’t object to spending billions more on the health sector. It’s a sector, and it’s growing, for heaven’s sake! They object to the fact that it’s overwhelmingly publicly owned, and they cannot make profits from it. 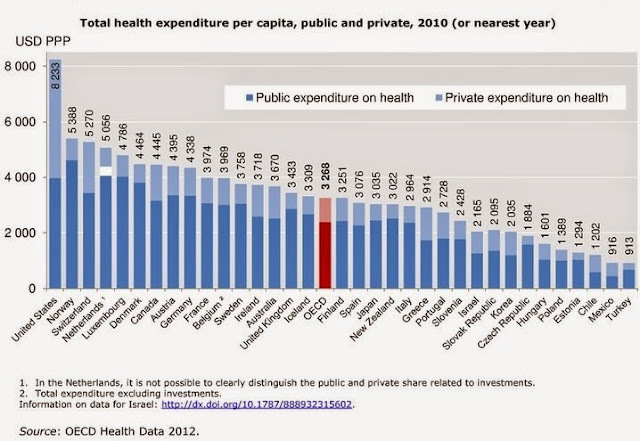 Never forget, in the USA where healthcare is the most privatised, health costs leave citizens with less money in their pockets while delivering worse results: $8,233 per capita in the US compared to our $3,268. 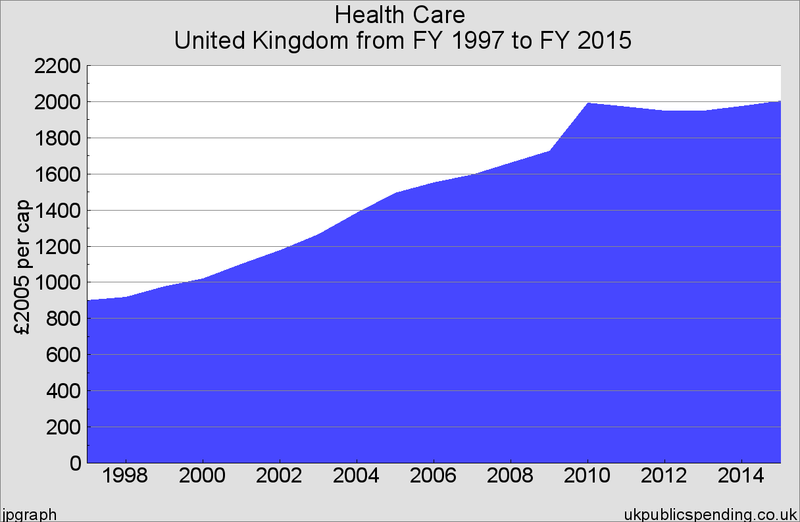 That's almost £4,000 more spent on healthcare per person, and not on other parts of the economy. It's why the makers and sellers of cars, games, soft drinks and pet products should be the first on the barricades to defend the NHS.